Just what is a REAL Christian anyway? Perhaps you've heard many different, conflicting definitions. But are you sure you have heard the real Bible definition? And how does one become a Christian? Are repentance and baptism necessary? These questions and more are all answered in this booklet. Perhaps you've heard many different, conflicting definitions. I have. But have you ever heard the real BIBLE definition? It is time you understood the very basic, down-to­-earth, fundamentals of Christianity — the very heart, the root and core of the teachings of Christ. I want you to realize that most professing Christians today believe the exact opposite from the very simplest, the clearest teachings of Christ! And so, let's go to the very basis of real Christianity — commonly called the "Sermon on the Mount." Actually, the scriptures found in Matthew's 5th, 6th and 7th chapters are not a "sermon," though they have been labeled as such by men who did not understand the Bible. This is one of the very first opposites you will see in comparing these plain, clear statements of Christ with the commonly accepted beliefs and practices of a modern "Christianity." "And seeing the multitudes, he went up into a mountain: and when he was set, his disciples came unto him ..." (Matt. 5:1). Yes, Christ wanted to escape the big crowds. "And the disciples came, and said unto him, Why speakest thou unto them in parables? He answered and said unto them, Because it is given unto you [His disciples] to know the mysteries of the kingdom of heaven, but to them it is not given.... For this people's heart is waxed gross, and their ears are dull of hearing, and their eyes they have closed; LEST at any time they should see... and should be converted, and I should heal them" (Matt. 13:10-15). How utterly different from what you've probably always assumed. You see, Jesus did not come to convert the world then. He came to establish His Church, to die for the sins of all mankind, to commission His disciples who were to carry His message to all nations. Christ came for many reasons — none of them to save the entire world at that time. He was a Divine Messenger, sent from His Father in heaven, to teach and train His disciples. "Disciple" merely means "student" or "learner." The next few verses are among the best-known in the entire Bible. Perhaps many of you can say them by memory. That is exactly why I want to analyze, carefully, every single one of them. I want to take the clear, best-known parts of Christ's teachings-and show you by them how utterly removed from true Christianity are most professing Christians today. Christ said, "Blessed are the poor in spirit: for theirs is the kingdom of heaven" (verse 3). No, Jesus doesn't mean to LACK the Spirit of God, as the foolish virgins (Matt. 25), but means blessed are those who are truly lowly, humble, yielding in attitude of heart and mind! How many "Christians" are truly Christ like in spirit? Jesus was completely "poor in spirit"! He was completely humble! A greater man never lived. A man never lived who could exercise more gigantic, all-encompassing power than Christ. There never was a more dynamic, lively, energetic, personable, talented man. There never was a man with more reason to get all "puffed up" and proud — filled with human vanity. But yet, Jesus was humble! Paul wrote, "Be of the same mind one toward another. Mind not high things, but condescend to men of low estate. Be not wise in your own conceits" (Rom. 12:16). It just isn't too "popular" to comfort a diseased, afflicted person, to care for invalids, to give something of yourself to someone who is really in need, is it? To be really poor in spirit is a great rarity today. Here is the next diametric opposite. Skipping ahead just two verses, Jesus said, "Blessed are the meek, for they shall inherit the earth." Does Christ mean to imply the "poor in spirit" are going to "heaven," but the meek are going to remain on earth? Look at it. What does it say? If Jesus promised heaven to the poor in spirit, then it is very clearly stated the meek are going to stay on earth! Read it again carefully. Christ said, "Blessed are the poor in spirit: for theirs is the kingdom OF heaven" (verse 3). That little word "of" qualifies the verse, makes it plain. It is a kingdom God promises His elect — a kingdom ruled by God FROM HEAVEN! It is a kingdom OF heaven, but not a kingdom IN heaven — and there is a great difference! What if Jesus had said, "For theirs is the Bank of Morgan"? Does this mean He promised the money, and the stocks, bonds, securities, the wealth of the bank which is in — inside of — Morgan? Why, of course not, this would be ridiculous! Notice the proof again right in the same section. "Blessed are the meek," said Jesus two verses later, "for they shall inherit the earth" (Matt. 5:5). He also said, "... No man hath ascended up to heaven..." (John 3:13). No! It means just what it says — that overcomers are to inherit the earth — the Kingdom OF heaven — not the Kingdom IN heaven (Rev. 2:26; 5:10; 20:6). Yes, here is another of the amazing, breathtaking opposites of your Bible from the commonly accepted and assumed teachings of the world. The ideas of men do not fit — even with the "Sermon on the Mount." The Kingdom OF heaven is a kingdom ruled by heaven, which is to come down OUT of heaven — to this earth! Just as the house OF John is not IN John, so is the Kingdom of heaven not to be in, but from heaven! Jesus said, "... I am come that they might have life, and that they might have it more abundantly" (John 10:10). Christ wants us to have life brimful and running over with joy. One of the first attributes of God's Holy Spirit, the very mind and nature of God, is joy (Gal. 5:22). But Solomon wrote, "For in much wisdom is much grief: and he that increaseth knowledge increaseth sorrow" (Eccl. 1:18). Christ was called a "... man of sorrows, and acquainted with grief..." (Isa. 53:3). But why? Because of the evil of man. Because of sin. When all mankind went the wrong way after God had revealed the right way to him, God"... saw that the wickedness of man was great in the earth, and that every imagination of the thoughts of his heart was only evil continually. And it repented [made sorry] the Lord that he had made man on the earth, and it grieved him at his heart" (Gen. 6:5-6). Yes, the One who became Christ was made mournful, and sorry, when He saw the wretchedness, the sickness, poverty, squalor, war and death man was bringing on himself. And so it is with a true Christian. Even though Christ wants us to have a more abundant life, He also inspired Solomon to write, "To every thing there is a season, and a time to every purpose under the heaven... a time to weep, and a time to laugh; a time to mourn, and a time to dance..." (Eccl. 3:1-4). Yes, blessed are they who mourn now. For they shall be comforted. They will experience great joy and happiness defying description in the Kingdom of God. Many mourn because of persecution! But do most modern Christians receive any persecution whatsoever for accepting the "modern" popular concepts of "Christianity"? Certainly not! But Jesus said,"... In the world ye shall have tribulation: but be of good cheer; I have overcome the world" (John 16:33). No, rather than suffering persecution, being given cause to mourn, most professing Christians today have come to believe the exact opposite. They feel, instead, that "belonging to a church" or "having some faith" will give them better standing in the community, result in better business relations, make them an accepted, integrated part of community life. This, too, is a direct opposite from the Bible teaching. There is a difference between being meek and being weak. Jesus was MEEK but not weak! Even though He was weakened physically when suffering the terrible beatings and lashings prior to His crucifixion (Paul said, "For though he was crucified through weakness, yet he liveth by the power of God... " II Cor. 13:4), Jesus was physically strong and healthy throughout His earthly life. Remember, Christ never sinned. He obeyed perfectly the physical laws of God which regulate health and strength, as well as the spiritual laws. What does it mean to be really meek? Look for examples in modern Christianity. Where do you find very much gentleness, kindness, yieldedness? To be meek means to yield rather than cause an argument or trouble. It means to be humble, to be lowly in spirit and attitude. A truly meek person will be Christlike in character. Jesus said, "Take my yoke upon you, and learn of me, for I am meek and lowly in heart..." (Matt. 11:29). Paul was inspired to write, "I therefore... beseech you that ye walk worthy of the vocation wherewith ye are called, with all lowliness and meekness, with longsuffering, forbearing one another in love..." (Eph. 4:1-2). Do You HUNGER FOR Righteousness? Jesus said, in the next of the "beatitudes," "Blessed are they which do hunger and thirst after righteousness, for they shall be filled" (Matt. 5:6). Just what is righteousness? It is to be right rather than wrong. It is to follow the right way, rather than the wrong way, which seems "right" to a man. But more than that, what is the Bible definition of "righteousness"? It's this: "All thy commandments are righteousness" (Psalm 119:172). The perfect, holy, Ten Commandments of God are righteousness. In this same fifth chapter of Matthew, Christ said, "Think not that I am come to destroy the law, or the prophets: I am not come to destroy, but to fulfill" (verse 17). And yet, haven't you always heard the exact opposite? Haven't you always heard Jesus came to do away with the Law? Why have you heard this? The Bible doesn't say so — rather, it says the exact opposite. Notice it. "Whosoever therefore shall break one of these least commandments, and shall teach men so, he shall be called the least in the kingdom of heaven: But whosoever shall do and teach them, the same shall be called great in the kingdom of heaven" (verse 19). God's Laws] shall exceed the righteousness of the scribes and Pharisees, ye shall in no case enter into the kingdom of heaven" (verse 20). Christ said, "Not every one that saith unto me, Lord, Lord, shall enter into the kingdom of heaven; but he that doeth the will of my Father which is in heaven" (Matt. 7:21). Jesus inspired Paul to write, "Circumcision is nothing, and uncircumcision is nothing, but [on the other hand, that which is important is] the keeping of the commandments of God" (I Cor. 7:19). This does not say some supposed "new commandment" of Jesus Christ. There is no way around it. There is no "spiritualizing" this plain statement away. Later, we read in I Corinthians 13 that without God's love we are nothing. Unless we have real love in our hearts, we are not Christians. And it is love that will lead us to keep God's Ten Commandments — all of them! "Love worketh no ill to his neighbour: therefore love is the fulfilling of the law" (Rom. 13:10). God inspired John to confirm this fact further, when he wrote, "For this is [here is the Bible definition of love] the love of God, that we keep his commandments: and his commandments are not grievous" (I John 5:3). To hunger and thirst for righteousness is to yearn, to strive, to struggle fervently to be obedient to God — to keep His laws, which are given in love, for our good. Those who are truly hungering and thirsting for righteousness will be studying constantly for new light, being willing to change when they see they've been wrong, admitting their wrong beliefs, their mistakes, their sins. "Study to shew thyself approved unto God" (II Tim. 2:15), wrote Paul to Timothy. "Prove all things" (I Thes. 5:21) Paul said to the Thessalonians. Do modern Christians really know their Bibles? Are most professing Christians you know studying diligently, searching the Scriptures daily, as the Bereans did (Acts 17:11), hungering and thirsting for God's righteousness? Are most professing Christians you know praying, fasting, getting closer to God daily by a constant contact with His Word? "Thy word is truth" (John 17:17) said Jesus. But most "modern" Christians don't even know what His Word says. You would be amazed to realize a vast percentage of professing Christians can't even name the four Gospels. They don't know the Bible — they aren't studying the Bible — because they don't really hunger and thirst for it. Do you? If you really are "hungering and thirsting" for righteousness, you'll be doing as the ones Jesus described in Matthew's 13th chapter. You'll be like the merchant who sold all to gain the one pearl of great price. You'll be like the man who found the treasure in the field, and sold everything to buy that one field. Are you like that? Most professing Christians today are not. If you want to really begin to understand your Bible better, to really see it made gripping, interesting — then write for the Ambassador College Correspondence Course. It's free of tuition — no charge whatever. You can have it free, if you really hunger for it! Yes, here's another great opposite. Law — that His perfect Law is the way to righteousness, most believe His holy Law has been done away. Instead of believing the straight­ forward statement of Christ that He did not come to destroy the Law, most believe the exact opposite, that He did come to destroy it! How utterly different is the real truth of your Bible. Surely you know what it means to be merciful. But when do you ever really show mercy? It's one thing to agree tacitly with Scripture, and another thing to put it into practice! James said, But be ye doers of the word, and not hearers only, deceiving your own selves" (James 1:22). He also wrote, "For whosoever shall keep the whole law, and yet offend in one point, he is guilty of all" (James 2:10). God says His mercies endure forever (Psalm 136). But when do you ever have an opportunity to show mercy? It is merciful to give instead of get. It is merciful to say nothing at all about someone, if you can't say something good about them. It is merciful to forgive a debt or obligation, rather than take a brother into court over it. It is merciful to treat all others as you want them to treat you. Are most Christians merciful today? Is it showing mercy to an enemy to send a bullet plunging into his vitals? Is it showing mercy to envy, to hate, to kill? Christ meant what He said! "Blessed are the merciful: for they shall obtain mercy" (Matt. 5:7). He shows further what He means when He gives an outline for prayer in the "Lord's prayer." "And forgive us our debts, AS [and only as — in the same measure as] we forgive our debtors" (Matt. 6:12). But there aren't many of those around today! Paul wrote, "Unto the pure all things are pure: but unto them that are defiled and unbelieving is nothing pure; but even their mind and conscience is defiled" (Titus 1:15). Nowhere, it seems, is there more debate, envy, ridicule, argument, deceit, hypocrisy and disagreement than among some who make a profession of religion. More wars have been fought in the name of religion than for any other reason. More people have been butchered, hanged, burned, wantonly slaughtered in the name of religion than for any other reason. Jeremiah reveals that "the heart is deceitful above all things, and desperately wicked: who can know it?" (Jer. 17:9.) An individual with the natural, physical, carnal mind has a defiled mind. He sees evil motives rather than good ones, he sees wrong implications behind every action, he sees suggestive or shabby meanings behind others' words. Paul said, "The carnal mind is enmity against God: for it is not subject to the law of God, neither indeed can be" (Rom. 8:7). The carnal mind is a resentful, defiant mind — a mind which is hostile to God and His perfect laws, and a mind with defiled conscience! It's about time we began to wake up and quit "kid­ ding" ourselves we're converted when many who sincerely believe they're "Christians" have never even begun on the road to real Christianity. Paul wrote, "Charity [love]... doth not behave itself unseemly, seeketh not her own, is not easily provoked, thinketh no evil..." (I Cor. 13:4-5). Yet it seems there are no more easily provoked people than those in various religious fields. A paradox? Or another exact opposite between the plain teachings of your Lord and Saviour and the common practices and habits of most professing "Christians" today? "Western" fans are familiar with the famous six­ shooter produced by Colt in the "wild West" days, called the "peacemaker." Presumably, the name was taken from the Bible. And herein is the philosophy of a "Christian" world. The way to peace, it believes, is through war. If you go to war, you will have peace. But think for a moment. The world has always known war. The world more than a quarter of a century ago fought "the war to end all wars." But has war ended? Has man's way been practical? Has man's way worked? Are all wars over? There have been over fifty frightening wars since World War II. Think! Man has irrevocably marched, step by step, along the route he has chosen, to stand on the brink of cosmocide! Man now stands, in his superior, "enlightened" state, on the verge of world suicide. Answer honestly. Has man been able to solve his problems through war? Jokingly some westerners in the United States began to call a gun the "peacemaker." But have guns brought peace? Jesus said, "Love your enemies, bless them that curse you, do good to them that hate you, and pray for them which despitefully use you, and persecute you" (Matt. 5:44). Do most "Christian" people believe this scripture? Certainly! But do they practice it? Isn't it about time we quit "kidding" ourselves? You know the professing "Christians" of today do not practice these things. When a REAL Christian gives this teaching of Christ as a reason for his belief that he should not murder, some who are church members will ridicule him. It seems ridiculous to most "Christians" today to really follow the teachings of Christ. And yet, they will appropriate His name. 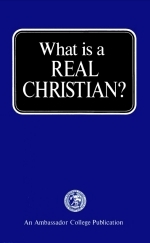 "What Is a Real Christian?" During World War II, German mothers and fathers flocked to their churches and cathedrals to pray for their boys at the front. In England, France, or here in the United States, other parents went to their churches to pray for their boys at the same front. In many cases the boys at the front, though of different races and speaking different languages, were of the same religion. If in the same community, they would have gone to the same church. "Christians" everywhere use the same book. They use, preach from, write about, and read-once in a while — the Bible. And regardless of in which land you find it, or in which language, the Bible says the same thing. Jesus said to love your enemies. How many "Christians" believe they should love their enemies? Let's stop "kidding" ourselves. You don't show love to someone by sending a bullet ripping, tearing, gouging its way through his vitals, leaving him to die retching out his life's blood. You don't show "love" to your enemy by vaporizing him. Yes, Jesus said, "Blessed are the peacemakers." And He didn't mean blessed are those who take up guns and then deceive themselves they're making peace! Listen! If guns make peace, where — yes, where, oh where on the face of this earth — is the peace they have brought us? Yes, we call ourselves "Christian" but it would embarrass us to tears to profess openly to really follow, to live by, the words of the One whose name we appropriate. Yes, blessed are the real peacemakers. They shall be called the children of God. God is producing children. John wrote, "Behold what manner of love the Father hath bestowed upon us, that we should be called the sons of God: Therefore the world [the society, the age, the people around us] knoweth us not, because it knew him not. Beloved, now are we the sons of God, and it doth not yet appear what we shall be: but we know that, when he shall appear [not immediately at our death] we shall be like him; for we shall see him as he is" (I John 3:1-2). To be born of God is to become like God, to become a member of the God Family. Paul wrote, "For I reckon that the sufferings of this present time are not worthy to be compared with the glory which shall be revealed in us" (Rom. 8:18). Jesus is called the firstborn of many brethren (I Cor. 15:20, 23; Col. 1:15, 18; Rom. 8:29). Jesus said, "Blessed are they which are persecuted for righteousness' sake: for theirs is the kingdom of heaven" (Matt. 5:10). Remember, He said, "In the world, ye shall have tribulation..." and also prayed to His Father, saying, "I have given them thy word; and the world hath hated them, because they are not of the world, even as I am not of the world" (John 17:14). Christ told His disciples to separate themselves from the society around them — to come out of the world, and to do, believe and practice different things. Notice the strong language about this in God's Word! "Ye adulterers and adulteresses, know ye not that the friendship of the world is enmity with God? Whosoever therefore will be a friend of the world is the enemy of God" (James 4:4). John commands true Christians, "Love not the world, neither the things that are in the world. If any man love the world, the love of the Father is not in him. For all that is in the world, the lust of the flesh, and the lust of the eyes, and the pride of life, is not of the Father, but is of the world. And the world passeth away, and the lust thereof: but he that doeth the will of God [which will is expressed in His Word] abideth for ever" (I John 2:15-17). Do most "Christians" today really COME OUT of the world, separating themselves from its customs, its habits and its ways? Do most really become so strikingly different that their former business associates, their relatives, neighbors and friends are actually startled by the great change in their lives? Paul says, "I beseech you ... that ye present your bodies a living sacrifice ... and be not conformed to this world: but be ye transformed by the renewing of your mind, that ye may prove what is that good, and acceptable, and perfect will of God" (Rom. 12:1-2). God thunders His warning through John, "Come out of her, my people, that ye be not partakers of her sins, and that ye receive not of her plagues" (Rev. 18:4). If you really come out of the world — you will suffer persecution! Notice it. "Think not that I — am come to send peace on earth: I came not to send peace, but a sword. For I am come to set a man at variance against his father, and the daughter against her mother, and the daughter in law against her mother in law. And a man's foes shall be they of his own household" (Matt. 10:34-36). If you really begin to change — if you really surrender your life to God — if you really begin to do as Christ did, to live as He lived — you will be persecuted. Notice II Timothy 3:12: "Yea, and all that will live godly in Christ Jesus shall suffer persecution." And if you're not being persecuted, the chances are, you are not a Christian! Jesus goes on to describe how really converted ones will rejoice when they receive this persecution that comes from living righteously, godly, in this present evil world. He says, "Great is your reward in heaven, for so persecuted they the prophets which were before you!" Yes, great, and incomprehensible is the reward of God's true saints, reserved for them in heaven, which is to come down out of heaven, to this earth! Jesus tells us to pray, "Thy kingdom come," not that we'll go to it. "Thy will be done in earth, as it is in heaven" (Matt. 6:10). How plain are the true teachings of Christ! And how different from what you've grown up believing and assuming! Yes, right here in the beatitudes, the "Sermon on the Mount," you can see clearly the majority of professing Christians just do not believe or practice what Christ said! It's shocking, but it's true. Most professing "Christians" today are not really practicing Christianity! Instead, hundreds of thousands are believing and practicing the same old pagan customs which Christ and the apostles vigorously condemned — and all the while calling it "Christianity." Your Bible said this present generation would be almost totally deceived. Christ said, "Take heed that no man deceive you, for MANY shall come in my name [coming as if they were the servants of Christ], saying I am Christ; and shall deceive many" (Matt. 24:4-5). Christ said only a very few — the very elect of God, who were being kept from the clever deceptions of Satan would not be deceived. "For there shall arise false Christs, and false prophets, and shall shew great signs and wonders; insomuch that, if it were possible, they shall deceive the very elect" (Matt. 24:24). Satan has deceived the world — and God has warned repeatedly through the New Testament that this would be so — in this age, now. In Revelation the twelfth chapter, the devil is described as a great dragon "which deceiveth the whole world." Either this world is deceived, or your Bible is not true! But the Bible is true — and this world is in the grips of a tremendous deception. A deceived person doesn't know he's deceived. He is sincere! But he's sincerely wrong! And so it is that scores, hundreds and thousands of sincere, well-meaning people — believing themselves to be in a "saved" condition, believing they are "Christian" are actually in tacit disagreement with real Christianity. Do you see how different the real Christianity of the Bible is from today's professing brands? People" movement. Somehow, many feel they need to "get right" with God — to join a church — to become more "religious." Others — especially young people disillusioned with the adult generation — are experiencing a growing fascination with the person of Christ. They seek Jesus through rock operas (Jesus Christ Superstar), Jesus songs, group baptisms, and so on. Thousands have "made decisions for Christ." But — whether it was an adult seeking solace because of financial reverses or a group of young people participating in a mass baptism in the Pacific Ocean — were these decisions real repentance? What did they do? How long did it last? How were they benefited? Continually, many people become "converts" at evangelistic campaigns. They try to "give" their lives to Jesus Christ. Usually, they are remorseful over some shameful deeds in their past — broken-hearted over the loss of a loved one — distraught with financial worry — sick and diseased in their bodies. Like all society — they are sincerely looking for something! But what do they find? How does a person do such a thing as giving his own self to Christ — becoming a true Christian? What does it mean? Is it merely a temporary decision, or a sentiment? Is it something that is of the emotions only? Or is it a down-to-earth, concrete, practical course of action — a way of living? A foremost religious leader once said: "First, let us understand what Christianity is NOT. It is NOT a way of life." But what does the newly converted Christian do then, that makes him a Christian? Commonly, it is believed that the remorseful feeling of sorrow over past mistakes and misdeeds, plus the acceptance of Christ — the worship of Christ — is a saving experience. Hundreds of thousands of sincere, well-meaning, earnest people are content they are Christians — satisfied they are headed toward eternal life — when they actually have never taken the first step toward becoming a true Christian, believe it or not. "From that time Jesus began to preach ..." (Matt. 4:17). Jesus was a preacher! Jesus Christ came with a message from God the Father — and that message was what He preached! What was the very first thing He told His audiences to do?"... REPENT: for the kingdom of heaven is at hand" (Matt. 4:17). Notice — the message of Jesus is: "REPENT!" God says, "For godly sorrow worketh repentance to salvation not to be repented of: but the sorrow of the world worketh death" (II Cor. 7:10). There is a "sorrow of this world" which is sheerly human and physical — it is EMOTIONAL — but it works death. Jesus said, "... Except ye repent, ye shall all likewise perish" (Luke 13:3, 5). In His parable of the one lost sheep, and the "ninety and nine," Jesus said, "I say unto you, that likewise joy shall be in heaven over one sinner that repenteth, more than over ninety and nine just persons, which need no repentance" (Luke 15:7). Jesus gave this example to show what a rare thing it is when one really repents. Later, the apostles — Peter, James and John, the Apostle Paul and others — preached the same message Jesus brought from His Father. When Peter stood up to explain the amazing events of the Day of Pentecost in 31 A.D. he said, "Repent, and be baptized every one of you in the name of Jesus Christ for the remission of sins, and ye shall receive the gift of the Holy Spirit" (Acts 2:38). Later, Peter said, "Repent ye therefore, and be converted, that your SINS may be blotted out, when the times of refreshing shall come from the presence of the Lord" (Acts 3:19). Then there is something required in addition to the acceptance of Jesus as personal Saviour. Jesus said so. "I'm a changed man," said the reformed smoker. "I have finally quit the tobacco habit!" This man felt, because he had dropped a bad habit, he was a changed man. But was he really? The Apostle Paul explained that the"... carnal mind is enmity against God: for it is not subject to the law of God, neither indeed can be" (Rom. 8:7). That carnal mind is the natural human mind — the normal, sincere, natural, common "way of looking at things." It's the mind of every normal human being PRIOR to this change Christ was talking about. Paul went on to say, "Now if any man have not the Spirit of Christ, he is none of his" (Rom. 8:9). Did you notice it? If a man have not the Spirit of Christ — he doesn't belong to Christ, and therefore is not a Christian. "... For all flesh had corrupted his [God's} way upon the earth" — Gen. 6:12. "If God will be with me, and will keep me in this way that I go..." — Gen. 28:20. "Ye shall walk in all the ways which the Lord your God hath commanded you ..." — Deut. 5:33. "My foot hath held his steps, his way have I kept, and not declined" — Job 23:11. "Teach me thy way, O Lord ..." — Psalm 27:11. "Our heart is not turned back, neither have our steps declined from thy way" — Psalm 44:18. "That thy way may be known upon earth ..." — Psalm 67:2. "... Quicken thou me 10 thy way" — Psalm 119:37. "This is the way, walk ye 1n it ..." — Isa. 30:21. "Walk ye in all the ways that I have commanded you..." — Jer. 7:23. "And it shall come to pass, if they [Gentiles} will diligently learn the ways of my people ..." — Jer. 12:16. "Thou hast made known to me the ways of life ..." — Acts 2:28. "And Saul, yet breathing out threatenings and slaughter against the disciples of the Lord, went unto the high priest, and desired of him letters to Damascus to the synagogues, that if he found any of this way ..." — Acts 9:1-2. "... And expounded unto him the way of God more perfectly" — Acts 18:26. "But when divers were hardened, and believed not, but spoke evil of that way before the multitude ..." — Acts 19:9. "But this I confess unto thee, that after the way which they call heresy, so worship I the God of my fathers ..." — Acts 24:14. "And when Felix heard these things, having more perfect knowledge of that way ..." — Acts 24:22. This change has something to do with the carnal mind, and the Spirit of Christ. Let's notice another important scripture. "I beseech you therefore, brethren, by the mercies of God, that ye present your bodies a living sacrifice, holy, acceptable unto God, which is your reasonable service. And be not conformed to this world, but be ye transformed by the renewing of your mind, that ye may prove what is that good, and acceptable, and perfect, will of God" (Rom. 12:1-2). Read that scripture again! Study it! God says you must undergo a renewing, a transforming, a changing — of the MIND! This changing of the mind is a change of human nature. The normal, natural way of human nature is the way of selfishness. The self is the entire motivating drive in human nature. It is the pleasing of the self, the satisfaction of the self — the way of getting for the self that is the basis of human nature. You are extremely selfish. All human beings are selfish. "Vanity of vanities, saith the preacher, vanity of vanities; ALL is vanity" (Eccl. 1:2). Every person is filled with vanity, in one form or another. Notice that Paul tells us, "For the creature [correct meaning "creation"] was made subject to vanity, not willingly, but by reason of him who hath subjected the same in hope" (Rom. 8:20). All is vanity! The desire of every person is to be "liked" by others — to be "well thought of," to be accepted by the society, looked up to, respected, admired, and loved by others — all this is vanity. It is this vanity which leads a person to say, "What will my friends say?" or, "What will people think?" Having been reared in a world that measures everything by what people think, you probably are quite concerned about the opinions of your friends, neighbors and relatives. You are wrapped up in this age, this society. Whatever is the standard, whatever is looked upon with approval by these people, whose acceptance you covet, that becomes the standard of your life. If you're like most people — you live in the way which is most likely to gain for you the acceptance and approbation you seek. You are a part of this world. Your life is regulated by this world and its customs, its holidays, its practices in business, in social life, in religious life, and all the many accepted standards of society which make up this "world." Many people have seen this desire to conform, and have rebelled against it. But, non-conformists who would be honest with themselves would be forced to admit their non-conformity is merely conforming to a DIFFERENT group than before. The "hippie" who claims to be "non-conformist" actually wears a uniform-addicts himself to certain clearly definable social customs as an obvious mark of his new conformity. "Kidding" himself he is "escaping" from the establishment, he enslaves himself to a new establishment. And all this is just so much vanity. It is to release us from these shackles of tradition and society that Jesus calls us out of this world. Jesus said, "My kingdom is NOT of this world" (John 18:36). He was the Messenger from God the Father of a better kingdom — the world-ruling Kingdom of God. When Christ walked this earth as a man, He spoke to His disciples of a soon-coming world government that would supersede and put down all opposing, man-made governments, and rule this world (Rev. 2:26-27). Did you know Jesus Christ Himself said if you are a true Christian, some of your former friends, your relatives and this society will hate you? "If the world hate you, ye know that it hated me be­ fore it hated you. If ye were of the world, the world would love his own: but because ye are not of the world, but I have chosen you out of the world, therefore the world hateth you" (John 15:18-19). Jesus said some members of your own family would begin to look down on you, if you are really willing to obey Him. "Suppose ye that I am come to give peace on earth? I tell you, Nay; but rather division: For from henceforth there shall be five in one house divided, three against two, and two against three" (Luke 12:51-52). If you are really following Christ — living as He lived, doing as He did — keeping God's Law as He did — this society, even some of your closest former friends and your own relatives, will begin to resist and persecute you. "Forasmuch then as Christ hath suffered for us in the flesh, arm yourselves likewise with the same mind ... For the time past of our life may suffice us to have wrought the will of the Gentiles... Wherein they think it strange [the former associates, with whom you followed the courses of society] that ye run not with them to the same excess of riot, speaking evil of you" (I Peter 4:1-4). Notice how strongly God impresses on every Christian that they must discontinue their relationships with this sinning society. "Love NOT the world, neither the things that are in the world. If any man love the world, the love of the Father is not in him. For all that is in the world, the lust of the flesh, and the lust of the eyes, and the pride of life, is not of the Father, but is of the world. And the world passeth away, and the lust thereof: but he that doeth the will of God abideth forever" (I John 2:15-17). Of course, true Christians have to live in this world (John 17:15). And even while fully obeying God — not being conformed to this world — they should try to "...live peaceably with all men" (Rom. 12:18). And if a true Christian has to disagree, he should do so without being disagreeable. Many a new Christian — a babe in Christ — has encountered problems with friends and family upon conversion. We have a FREE reprint article showing how to cope with such problems. Follow link for your copy of "Should You Try to Convert Others?" In Luke 14 Jesus sternly warns every prospective Christian to count the cost of being a true follower of Him. How many people are being told to count the cost — or even told what that cost is, in today's great evangelistic efforts which invite people to "make a decision for Christ"? No! They most decidedly are not. Many people are being led to "accept Jesus" or to "receive Him" today, in a moment of emotional remorse over past mistakes. But many thousands do not know what to do to really become a Christian. Remember, Jesus tells you what you must do to become a Christian. "Not every one that saith unto me, Lord, Lord, shall enter into the kingdom of heaven; but he that DOETH the will of my Father which is in heaven" (Matt. 7:21). "Repent" said Christ. "Do the will of God," said Jesus. God's will is expressed in His Word. "Thy word is truth" (John 17:17). It is the truth, the Word of God, that will set you free. Here, then, is what it really costs to become a true Christian, and to become a begotten son of God. Does that shock you? Perhaps it does unless you think I mean that statement as a kind of "spiritual phraseology" which is just another way of saying "set your heart on the Lord" or some similar sentiment. After you have been broken up, and your own human will has been totally shattered, after you are disgusted with yourself — filled with abhorrence at your own actions, your own way of life — your own self, which is the vanity within you — then you should be baptized. The Apostle Paul was a true Christian. He had the Spirit of God, which is promised to everyone who is willing to lay down his life and surrender the self-will, who fulfills the ordinance of baptism, and comes to God's throne of grace as a meek child. Paul said, "I am crucified with Christ: nevertheless I live; yet not I, but Christ liveth in me: and the life which I now live in the flesh I live by the faith of the Son of God, who loved me, and gave himself for me" (Gal. 2:20). After repenting, and being baptized, which symbolizes the burying of the old carnal self, which was formerly hostile toward God — the Holy Spirit is then implanted within your mind, and changes your mind. Jesus Christ begins to motivate your thoughts, guide and direct your every action — live His life over again, WITHIN YOU. This is a great mystery to most human beings — and yet, the Spirit of God must enter our carnal minds to change those minds, and make them yielding, humble, and obedient to God, where they had been hostile, antagonistic, resentful, and bitter toward our Creator. Your outlook and attitude will gradually become Christlike. You will begin saying, with Christ, "Nevertheless not my will, but thy will, be done." Where you formerly "went along with the crowd" in social activities and business practices, you will then begin to question the ways of the crowd. You will want to first ascertain what God's will is concerning these ways of life. A Christian is a person who lives by every word of God. "Man shall not live by bread alone, but by every word that proceedeth out of the mouth of God" (Matt. 4:4). So said your Saviour. But are most professing Christians really living by every word of God? Not so! Most professing Christians do not even know a small portion of what the Word of God says. It is because they don't study the Bible, and begin to drink in of the Word of God that they gullibly swallow and accept whatever others say and believe. A Christian, then, is conquered by God. His carnal will is broken. He realizes he has sinned. Sin is any action that is contrary to the Law of God (I John 3:4). He then cries out to God and asks for forgiveness for those sins, and a lifting of the death penalty, which every sin brings (Rom. 6:23). He accepts God's promise of forgiveness, on faith, by accepting the sacrifice of Christ, accepting Jesus' death in place of his own. The Christian then takes the ordinance of baptism which shows God he really means it. The true Christian, who has really repented, will LIVE as Christ lived! He will keep the laws of God, being obedient to God in every way, and becoming a recipient of the great happiness and tremendous blessings that come with that obedience. Study these scriptures in your own Bible. Many of you think you are already "saved" and that you are already good Christians. But "Let him that thinketh he standeth take heed lest he fall" (I Cor. 10:12). That is what it means to be a real Christian! It was a hot, steamy, sweltering day, with the heat assailing the followers in waves from the blistering pavement under their feet. As the hoarse voice of the street-corner evangelist grew in fervor and intensity, the excitement of the crowd mounted. Finally, an impassioned street-corner plea for repentance was given. Dozens rushed up — tears coursing dusty rivulets down flushed and perspiring faces as they were swept along on the crest of a tidal wave of human emotion. The evangelist had secured permission from the city Fire Department to turn on a street-corner fireplug. He sprayed the whole crowd — with a fire hose. At that same hour, on a Sunday morning, a cultured, well-dressed young couple stood solemnly, proudly holding their firstborn infant before the pastor in a fashionable church. The scene shifts again. A baptizing service is in progress in another church. In waterproof costumes and black robes both the pastor and candidates step down into the tank of water. The pastor bends the candidates over backward, completely immersing them under the water. Here we have pouring, sprinkling, immersing — sometimes indoors, sometimes outdoors. Babies are being sprinkled. Some adults are required to repent. Others are baptized on profession of Christ without any repentance. In many churches there is no baptizing whatever. But it seems that in all this there is confusion. Jesus Christ said such things would happen. He warned you would be living in a world literally filled with religious confusion. He said, "... Take heed that no man deceive you. For many shall come in my name, saying, I am Christ; and shall deceive many" (Matt. 24:4, 5). Notice Christ said MANY would be deceived, and that many would come "in my name," that is, using the name of Jesus Christ as if they had His authority. He said, "And many false prophets shall rise, and shall deceive many" (Matt. 24:11). In the hodgepodge of conflicts, schisms, splits, divisions, arguments, personal interpretations and private philosophies that make up our Western world of Christian religion — one starkly clear fact stands out: these plain — spoken prophecies of Jesus Christ have come to be true, literally! Jesus Christ of Nazareth said the great majority would be. Most never think to put it this way: "Surely all these churches can't be right!" All you need to do is simply add two and two together. The very fact there are so many different views proves, in itself, the latter statement! No, they can't all be right. The dilemma facing each layman, then, is to find out who is right, and how you can prove it. Remember, the Apostle Paul said, "Prove all things; hold fast that which is good" (I Thes. 5:21). Isaiah said, "To the law and to the testimony: if they speak not according to this word, it is because there is no light in them" (Isa. 8:20). The Apostle Paul taught a group of Jews in Berea who were. "... more noble than those in Thessalonica, in that they received the word with all readiness of mind, and searched the scriptures daily, whether those things were so" (Acts 17:11). That is why we constantly say, "Don't believe us, un­ less or until you check up, and prove everything in your own Bible." Jesus Christ of Nazareth was baptized. Later, you will see baptism is an outward symbol of the burial of the old self, and of the resurrection to life — to live in a new and a different way. Baptism is commanded as an outward sign of our repentance, and willingness to surrender our lives completely to God — being willing to bury the old self. Jesus never sinned. He did not need to be baptized as a repentant sinner-but only because"... Christ also suffered for us, leaving us an example, that ye should follow his steps" (I Peter 2:21). Christ's baptism, then, was an example to all true Christians. "Then cometh Jesus from Galilee to Jordan unto John, to be baptized of him. But John forbad him, saying, I have need to be baptized of thee, and comest thou to me? And Jesus answering said unto him, Suffer it to be so now: for thus it becometh us to fulfill all righteousness. Then he suffered him. And Jesus, when he was baptized, went up straightway out of the water: and, lo, the heavens were opened unto him, and he saw the Spirit of God 'descending like a dove, and lighting upon him. And lo a voice from heaven, saying, This is my beloved Son, in whom I am well pleased" (Matt. 3:13-17). Notice! Jesus said, "Permit it to be so now — for thus it becomes us to fulfill all righteousness." John recognized Jesus did not need to be baptized, but that rather, John was the one who needed baptism. Peter, preaching on the Day of Pentecost in 31 A.D., said, "...Repent, and be baptized every one of you in the name of Jesus Christ for the remission of sins, and you shall receive the gift of the Holy Spirit" (Acts 2:38). Later, He said, ''Repent ye therefore, and be converted, that your sins may be blotted out, when the times of refreshing shall come from the presence of the Lord" (Acts 3:19). Many were deeply convicted as a result of the fantastic miracles they had seen, and the almost incredible fact of the resurrection of Jesus Christ. God says, "Then they that gladly received his word were baptized: and the same day there were added unto them about three thousand souls" (Acts 2:41). Notice, the very first thing they did after really experiencing true repentance was to be baptized. The Apostle Paul wrote to the Ephesians, "There is one body [one true Church of God], and one Spirit [the Holy Spirit of God], even as ye are called in one hope of your calling; one Lord, one faith [body of belief, true doctrine], ONE BAPTISM, one God and Father of all, who is above all, and through all, and in you all" (Eph. 4:4-6). Notice it — there is one baptism. That is, there is only one valid, authorized, right baptism according to the divinely inspired Word of God. There are not two or three different modes or methods, not several different manners in which it may be done each one "as acceptable as the other." God did not leave it up to this world to devise some "form" of man-made religious rites, attaching the name of Christ to it, and calling it Christian. God allows us to decide, not what will be our method or mode of worshipping and serving Him, but WHETHER we will obey the ONE mode which He, the Creator, has set before us. What, then, is that "one baptism"? The Greek word baptizo means to submerge, to immerse, to bury, to plunge into. The very word itself cannot at any time, mean anything other than to submerge or to immerse, fully, in water. God could have inspired another word than the Greek baptizo to be used in discussing this important topic if He had not wished to perfectly picture the THREEFOLD meaning of WASHING, BURIAL and RESURRECTION (Rom. 6:4-5). For example, the words ekcheo, proscheo and katacheo all come from the root cheo which means to POUR OUT. They are used in such scriptures as John 2:15; Acts 2:17-18; Revelation 16:1-4; Hebrews 11:28; Matthew 26:7 and Mark 14:3 in reference to pouring out money, the Holy Spirit, vials of wrath, a box of ointment or sprinkling the blood of sacrifice. Some churches pour or splash water at their "baptisms," erroneously thinking this is what God means when He says baptizo. Another word, rantizo, is used in Hebrews 9:13, 19,21; 10:22; 12:24 and I Peter 1:2 where it means, as it always does, to SPRINKLE. Some churches sprinkle (rantizo) thinking they are baptizing (baptizo). The words just do not say the same thing. They are entirely different. God inspired the Greek word baptizo to be used in every case when His Scripture deals with baptism. This word is never translated by the English word "sprinkle." It does mean to "wash" or "bathe," but by DIPPING, SUBMERGING, IMMERSING. It is used as a figure of speech to indicate being overwhelmed. It is used classically when speaking of people swimming and a ship sinking. You can't swim in the outpouring of a handful of water. A ship can't sink in a splash. A body can't be buried in a sprinkling of anything — water or dirt. Notice again the example you read in Matthew 3:13-17. Jesus came to find John on the edge of the river Jordan. But why there? If Christ had wanted to authorize the sprinkling of infants, or "pouring" of water out of a pitcher over someone's head, why did He go all the way to the river Jordan? Notice, "And Jesus, when he was baptized, went up straightway OUT OF the water" (Matt. 3:16). What was Jesus doing in the water — if the mode or method He intended to authorize were that of sprinkling or pouring? Notice Mark's account: "And it came to pass in those days, that Jesus came from Nazareth of Galilee, and was baptized [the Greek word again meaning submerged, buried, or immersed!] of John IN Jordan. And straightway coming up out of the water, he saw the heavens opened and the Spirit like a dove descending upon him" (Mark 1:9, 10). Notice further, that the baptism of repentant believers required MUCH water, not just a cupful, or a few handfuls. "After these things came Jesus and his disciples into the land of Judaea; and there he tarried with them, and baptized [read John 4:1-2, however, which states that Jesus Himself did not baptize, but His disciples or students acted in His behalf]. And John also was baptizing in Aenon near Salim, because there was MUCH WATER there: and they came, and were baptized" (John 3:22-23). John had gone to this specific location because there was much water available for baptism! Baptism, is, then, a total submerging into the water as a sign of the burial of the old self. Have you ever seen a funeral where the corpse was left lying above the ground, and a few handfuls of dirt sprinkled over its head? Of course not — this would be absolutely ridiculous, and contrary to all laws of health and common sense. Immersion into a watery "grave" is a deep spiritual symbolism which signifies the actual, literal burying of the old self-you, the way you have been — and the resurrection of a new you — now conquered by God, surrendered to God, meekly and humbly childlike in your obedience and trust in Him as your living Saviour. "Know ye not, that so many of us as were baptized into Jesus Christ were baptized into his death? Therefore we are buried with him by baptism into death: that like as Christ was raised up from the dead by the glory of the Father, even SO we also should WALK IN NEWNESS OF LIFE. For if we have been planted together in the likeness of his death, we shall be also in the likeness of his resurrection: Knowing this, that our old man is crucified with him, that the body of sin [the former "you"] might be destroyed, that henceforth we should not serve sin" (Rom. 6:3-6). Paul explained this principle further when he said, "For I was alive without the law once [without a knowledge of the Law]: but when the commandment came [to his consciousness — so he became aware of what sin was] sin revived [he was able to see clearly that he was a great sinner] and I died" (Rom. 7:9). Paul said, "For sin, taking occasion by the commandment [being brought to light for what it was by the laws of God] deceived me, and by it SLEW me. Wherefore [because God's Law had shown him he was a sinner] the law is HOLY, and the commandment HOLY, and JUST, and good" (Rom. 7:11-12). So you see, baptism symbolizes BURIAL. The Apostle Paul said, "I am crucified with Christ: nevertheless I live; yet not I, but Christ liveth in me: and the life which I now live in the flesh I live by the faith of the Son of God, who loved me, and gave Himself for me" (Gal. 2:20). God commands, through Paul, "I beseech you there­ fore, brethren, by the mercies of God, that ye present your bodies a living sacrifice, holy, acceptable unto God, which is your reasonable service. And be not conformed to this world: but be ye transformed by the renewing of your mind, that ye may prove what is that good, and acceptable, and perfect, will of God" (Rom. 12:1, 2). If a person is experiencing true repentance, he is literally giving his own self to God. He is reckoning himself dead, so far as sin is concerned, but alive through God and His Son Jesus Christ our Lord. "Let not SIN [and sin is the transgression of the law — I John 3:4] therefore reign in your mortal body, that you should obey it in the lusts thereof'' (Rom. 6:11-12). Since ALL have sinned (Rom. 3:23) and come short of the glory of God — and since the wages of sin, which is the breaking of God's Law (I John 3:4) is death — therefore baptism symbolizes that death. But we DO need to symbolize the death of our "old man" by being symbolically buried underneath the water in baptism. "For if we have been planted together in the likeness of his death, we shall be also in the likeness of his resurrection: knowing this, that our old man is crucified with him, that the body of sin might be destroyed, that henceforth we should not serve sin" (Rom. 6:5-6). Though Christ died for our sins — He nevertheless demands our obedience to His example and His command that we typify the crucifixion and burial of the old self, by being immersed into a watery "grave," and being raised up immediately as if in a resurrection, to live in a totally different manner. This is the only authorized "mode" of baptism given anywhere in the Bible — and any other method or "mode" devised of man is absolutely contrary to God's inspired Word, and is not valid. Surely it must be a terrible travesty to God to see a literal carnival made of such a deeply personal and absolutely serious event as the baptism of a sinner, symbolizing the death and burial of the old self, and as an outward sign of total repentance. Some say you should be baptized in the name of Jesus only. Others say it should be done in the name of the Father, the Son, and the Holy Spirit. Who is right? The Bible itself leaves us in no doubt. Acts 2:38 is very explicit: "...be baptized every one of you in [Greek en] the name of Jesus Christ..." What does a policeman mean when he arrests someone "in the name of the law" or a British official who acts "in the name of the Queen"? The obvious meaning is that this particular act is being done by the authority of the law [government] or the Queen. So whoever baptizes should do it with Christ's authority, by being a true and appointed servant of Jesus Christ. We discuss later in this chapter whom you should see in regard to baptism. But notice now a further instruction about baptism in Matthew 28:19: "Go you therefore and disciple all the nations, immersing them into [Greek eis] the name of the Father, and of the Son, and of the Holy Spirit" (Rotherham translation). The new convert is actually becoming a new son of God — to enter into God's Family. Thus, he must be baptized into the name of that Family. Since baptism is an outward sign of total repentance, and of the willingness to bury the old self, it never should be done to infants. Baptism symbolizes the putting away of the life of sin. It symbolizes the death and burial of an "old self." It does not constitute some "magical formula" for getting oneself into the "good graces" of God. Baptism is NOT a secret ritual for "joining a church." Baptism is NOT a "christening" of a baby at birth. Baptism is not valid if it is done by pouring, sprinkling, dabbing with a damp cloth, or cavorting under a fire hose. It would be a very rare thing if a young teen-ager of even 16 or 17 is truly ready for baptism. There have been cases where boys and girls of this age have been able to come to the place of real repentance — but these are few and far between, indeed. Baptism should be done as the result of complete and total repentance toward God and complete faith in the blood of Jesus Christ. Only a mature mind, one which can truly "count the cost," should consider baptism. But what about you? Have you been baptized? Was it done the way God commands? Did you really repent first? Did you know what repentance is? Did you know what to repent of? Did you really KNOW exactly what sin is, ac­ cording to the Bible? Did you come to feel deeply broken up over your past way of life, the method you used in conducting your private affairs, your business, your home? Did you become so thoroughly disgusted with yourself, your very nature and personality, your habits and methods of expression, that you simply couldn't stand to live with yourself any longer? Did you not only feel this as a deep and very real emotion, but did you thoroughly understand that you must yield in complete obedience to God and His Law? Had you really come to Jesus Christ in unconditional surrender of your rebellion against God's ways? Had you thoroughly repented of going with the world? Did you understand, fully, that you were being buried, and that a "new you" was to emerge from the water? Did you really "count the cost" (read Luke 14:25-33) when you were baptized? Perhaps you are like many who have written to us. They can "see" many new truths by reading our Ambassador College publications. They listen, and they "agree with" many things they hear on The WORLD TOMORROW television and radio programs. Perhaps, many, many years ago they were "baptized." This may have been during a revival, a tent camp meeting, at the local church, or even when they were an infant. They realize there was no really dramatic change that took place in their lives when they were "baptized," but feel "satisfied" since they are now learning some new "points of truth." But THIS IS NOT ENOUGH! Remember-and never forget — that belief without obedience is not enough to get you into God's Kingdom. Even the demons "believe and tremble" (James 2:19). Satan the devil is the greatest "fundamentalist" of all time. He believes Jesus is the Christ. He believes in the virgin birth, the temptation and trial of Jesus, the crucifixion and resurrection of Christ, that Christ ascended to the right hand of God the Father, and that He is coming again. He believes in all the essentials of salvation! He knows they are true — but he won't obey them! Belief coupled with obedience is necessary to gain the Kingdom of God. What about it? Are you being truly honest with yourself? For those of you who have been baptized in the past or have had a "religious experience," the puzzling question often arises: "What should I do? Should I be RE-baptized?" Remember the example of Apollos, back during the early days of the New Testament Church? He was an enthusiastic and eloquent speaker whose zeal at first exceeded his wisdom and understanding. He had heard, and he repeated certain things he had heard, about Jesus Christ and John the Baptist, about the message they preached. He preached it himself and convinced many of its merits. They were baptized, believing in the message Apollos had taught. But when God's Apostle came to question the people who had been taught and instructed by Apollos, he found there was a key ingredient missing in Apollos' teaching. He had failed to instruct them regarding God's Holy Spirit — His Mind, His Power, His very essence which He grants and gives to us to beget us as His sons, to give us the power to overcome our human tendencies! Paul not only found that those people hadn't received God's Holy Spirit, but they didn't even know what it was. And there are a surprising number today who share a similar lack of basic knowledge absolutely vital to salvation. Apollos himself needed further instruction. He received it from a dedicated couple in the Church of God, and from the ministers in the Church of God. And, of course, those individuals to whom he preached needed further instruction, which they received from God's ministry of that day, and were all re-baptized! (Read this account in Acts, Chapter 19.) If this be your situation, you may need to consider re-baptism. Whether or not you are aware of it, you are traveling down a one-way street. There is no turning around, no side road, no escape from that one-way journey. It is the journey of your present human, physical life. You, as a living, thinking human being — with your own settled "way," your friends, relatives and associates, your whole routine and way of life, are growing toward an eventful and fateful day. You are approaching a major crossroad! Along that one-way path is a major intersection. It is a branching of the road. You must choose — "... I have set before you life and death, blessing and cursing: therefore CHOOSE LIFE ..." (Deut. 30:19). If you have come to see the truth of God, and you have come to realize you are a sinner (Rom. 3:23), that sin is the transgression of God's Law (I John 3:4), and you, therefore, are a law-breaker worthy of death (Rom. 6:23) then God calls upon you to repent! This is that inescapable intersection you are approaching. It is the place in your life where Almighty God is going to hold you absolutely accountable for the precious knowledge you are receiving — and is going to ask you, "What have you done about it?" What will be your answer? From the letters of many hundreds of you, we know there are a number who really do want to do something about it. For those who have come to realize they must have the precious blood of Jesus Christ to blot out their past sins — and desperately want God's forgiveness, and who want to begin to really obey God, unconditionally — here is good news! The Worldwide Church of God has ministers in all parts of the United States and many other parts of the world. They are ready to counsel with you personally-to answer questions — to help you with any spiritual problems — and even to baptize any who are ready for it. So please feel free to invite such a personal visit. That's what these trained and consecrated men are there for. Actually most of them are ordained ministers. They, and we here at the Headquarters of this great Work, want only to help — to serve. We count it a privilege to do so. We won't send anyone to see you, unwanted. But we will be glad to help in any way possible upon your personal request. Remember, God commands us all to GROW in grace and knowledge (II Peter 3:18). The way to grow is by a careful, constant study of the inspired Word of God. "So then faith cometh by hearing and hearing by the word of God" (Rom. 10:17). Use your time. Study the Bible! Study the scriptures of down-to-earth, solid, specific points on Christian living God demands of every child of His. Put yourself into the picture, check up on yourself , and apply these inspired words of God to your own life.• Grow closer to God, make sure you are really repentant. You have been given precious knowledge in this booklet — and, if you have the spiritual courage to actually check up and prove these scriptures are really in your Bible — you will never again be deceived about what it means to be a real Christian.